Rome (Agenzia Fides) - "The north of Uganda now lives in calm. The LRA threat concerns the past, since this guerrilla group is no longer present in Uganda, but has moved to some areas of neighboring Countries such as the Democratic Republic of Congo, South Sudan and the Central African Republic", says to Agenzia Fides His Exc. Mgr. John Baptist Odama, Archbishop of Gulu and President of the Episcopal Conference of Uganda, in Rome for an Ad Limina visit. "This does not mean we have to lower our guard. 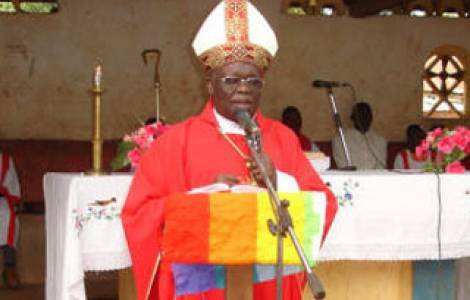 The situation must be constantly monitored to prevent the LRA from returning to Uganda", adds the Archbishop. The Lord's Resistance Army (LRA) raged in northern Uganda for decades, especially in the area of the Archdiocese of Gulu, terrorizing the civilian population, for a long time forced to take shelter in churches and sheltered camps to escape the violence of the guerrillas. The LRA is sadly famous for capturing children forced to become soldiers after suffering heavy psychological conditions. For this reason, says Mgr. Odama, "the Church continues to assist the populations to heal the deep wounds inflicted in all these years by the LRA, both at a material level and above all at a psychological and spiritual level. We organize peace building seminars and interreligious work groups to offer support to those in need of assistance. We are investing in the Catholic University of the Sacred Heart of Gulu to address the most serious post-war problems: psychological and psychiatric traumas. It does not only concern the population of northern Uganda but of the entire Country and even of those close to it such as South Sudan, the DRC and Central Africa. We are therefore trying to strengthen university teaching to train psychologists working in support of the population".